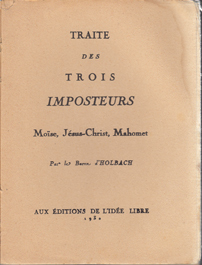 The Treatise of the Three Impostors (Latin: De Tribus Impostoribus) is the name of a book denying all three Abrahamic religions: Christianity, Judaism, and Islam. The three “impostors” of the title were Jesus, Moses, and Muhammad. The existence of such a book, and the attribution of its authorship to various heretics and political enemies, was a running theme from the 11th to the 18th centuries, when hoaxes in Germany and France produced two physical books.